Sebasticook Valley Hospital is a critical access hospital located in Pittsfield, ME. The new wing has a total of 17 private rooms with private bathrooms and features an additional 5 super semi-private rooms, each of which has two beds with separate bathrooms. The design provides a completely private setting for 20 patients, each with their room flexibility to accommodate family stay situations, hospice, or special care scenarios. Sebasticook Valley Hospital (SVH) is a critical access hospital with an average daily inpatient census of less than 15 patients. 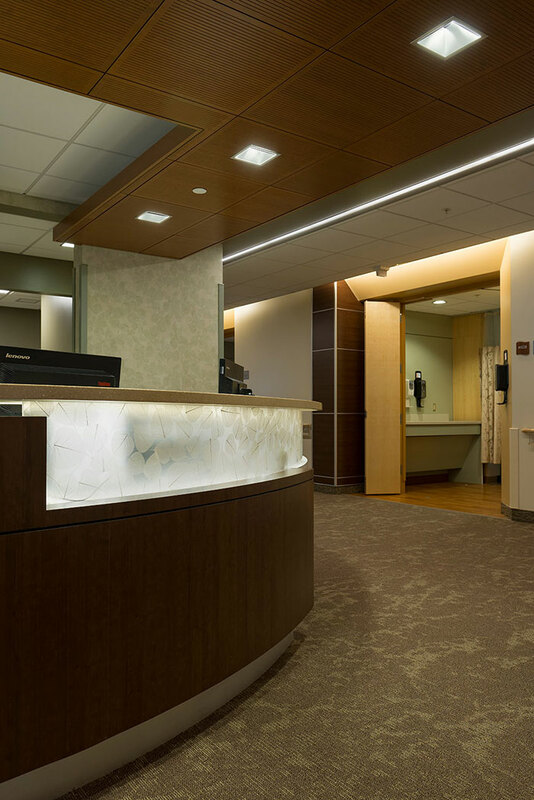 After careful analysis of projected patient volumes and mix of patient types, SVH chose to deviate from the current trends of 100 percent private patient rooms, to a mix of 15 private rooms and 5 super semi-private rooms. The super semi-private room is a new concept in patient room planning. It provides all of the family center care attributes of a private patient room, and the efficient staff work flow of a semi-private patient room. The design provides a completely private setting for 20 patients, each with their own private bath and room flexibility to accommodate family stay situations, hospice, or special care scenarios. Responsible for complete design of interior finishes and furnishings for this renovation.